SMILE! - San Diego Cosmetic Dentistry - 877.575.8335 . Tooth whitening is an in-office bleaching procedure that corrects stains and discolorations of the teeth. This is an easy process that takes about 90 minutes, requires no anesthesia nor damage of teeth, and produces immediate white, bright results. Understanding What Makes You a Candidate. 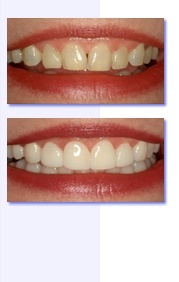 We can help you, at your initial complimentary consultation, determine your candidacy for teeth whitening. We usually check the condition and strength of your teeth through a brief exam. Patients with recently taken x-rays can also bring them in for review. There are in-office methods that prove to be superior in most cases, but some cases do call for at-home procedures. We can help determine which one is best for your needs. A package treatment that would combine both methods is sometimes recommended for enhanced results. With most of these procedures, a bleaching gel is applied before treatment. The intense light of choice is then directed at the teeth, by the doctor, activating the bleach. This usually takes about 1-2 hours while you relax in anticipation of your improved smile. Results are noticeable immediately, and can last for up to a few years. Some patients report a mild ache for about a day following treatment, but can easily treat it with pain medication. Some patients also notice sensitivity to food and drinks for a couple days after treatment, but that is temporary. Still Looking for cosmetic dentists nationwide? Try HealthySmileForum.com!